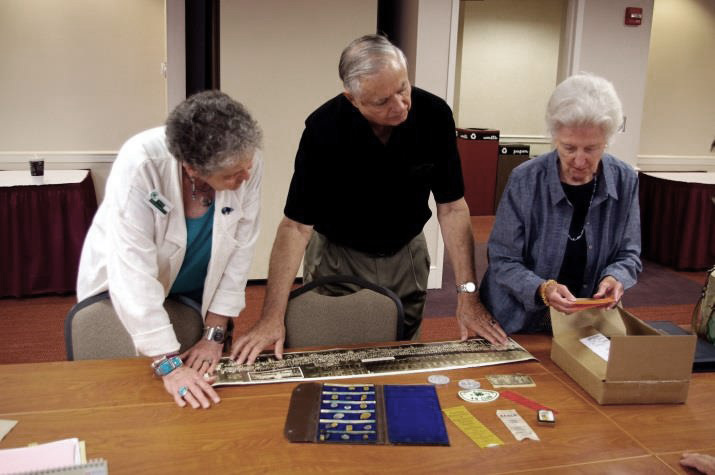 History team members, Sue Benedetti, Larry Krug and Eleanor L. Wilson take a look at early national 4-H panorama photo and 4-H pins and medals sent by Jim Potts from his father’s long history with 4-H. The National 4-H History Preservation leadership team receives a number of queries about donating 4-H historic materials and artifacts to the program. If local materials, we normally refer them directly to a county or state 4-H office. If the materials have national or nationwide historic significance… and are materials we do not already have, we gladly welcome the contributions. Or, sometimes we borrow the printed or film-A/V materials for scanning purposes and then return them. There are many pieces of nationally produced 4-H literature, particularly from the 1960s-1980s, of which we do not yet have copies. Also, printed programs from many national events, national 4-H calendars and artifacts from the national events. Most nationally produced 4-H films and other A/V materials are also still lacking.